Shutter actuator with manual actuation and status display for each output. 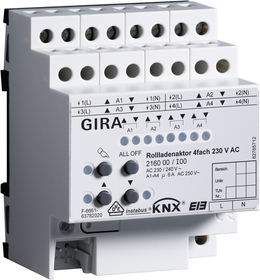 For controlling electrically operated shutters for mains voltage of AC 230 V (4-channel). Connection of various external conductors. Independent control of the four shutter outputs. Behaviour after bus voltage failure and recovery can be set. Assignments of up to five different safety functions (three wind alarms, one rain alarm, one frost alarm) or optionally with cyclical monitoring. Building site operation: Outputs can be operated manually without bus voltage with operating voltage only. Product database from ETS3.0d, 70 KByte.